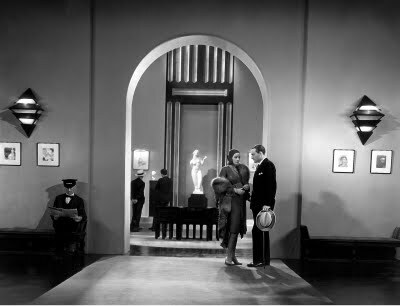 The Kiss opens with an art gallery tour guide running comically fast past a row of paintings while the camera pans right to keep pace—then slows, and dips down, to Greta Garbo. And Conrad Nagel, but who cares? Garbo. Revealed in the opening minute of a film. Not for us, this time, the glory of a Garbo reveal, such as the one in Flesh and the Devil (1926) that shuddered my breastbone. Here we have the Sphinx from the start, upfront and kind of stressed, once again the object of a man’s obsession, but, in this case, well along in a sexless tryst behind the back of her older husband. Garbo is Irene Guarry, a French woman of means; Nagel is Ardré, a notable defense lawyer. Their love is real. This gallery is where they rendezvous, but now, Irene feels, they must stop. And for a while, they do. That The Kiss doesn’t really involve Nagel is another of maybe a dozen things that make it strange, and strangely compelling, to anyone used to the Garbo boilerplate. I got the feeling that The Kiss, Garbo’s last silent film, was acted on the sly, as though everyone knew the Temptress had run its course and wanted to see how little they could build around the character and still make it work. For The Kiss is short: 62 minutes; without a subplot of any kind, one scant scene of comic relief; a barely resolved second act and no real third act at all. 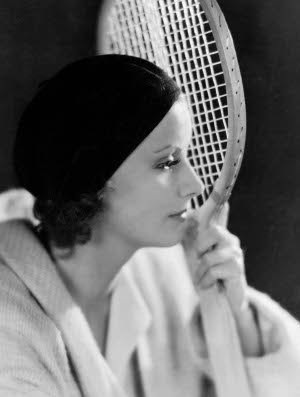 Garbo’s Irene is benign by her standards; a nice lady whose magnetism is unweaponized and who tries, earnestly, to spare Ardré further torment. Compare it to the emotional destruction she deals Nagel’s character in The Mysterious Lady (1928): If you’ve seen both films, the difference is striking. And The Kiss presumes you have seen it, along with a lot of other Garbo films. Called upon to deliver, any great performer falls back on the stocks-in-trade that brought her to the fore, and so it is here. 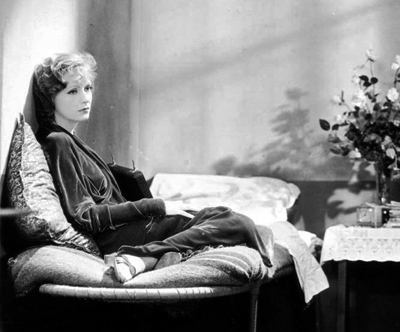 Absent a real story or much of anything else, Garbo gives us Garbo, and of course, it works. What set Greta Garbo apart from other actresses of the silent period was not simply her looks; there were others as beautiful, including Louise Brooks and Dolores Costello. What made Garbo special was her ability to invest moments with an extreme and urgent sexual tension, vastly beyond attraction or even lust. Garbo’s acting, across near a century of time, can still put a tingle in your gut; making you wonder if her hitch of breath or the tiny incline of her face toward her man are the last falterings of conscience before she’ll tear off her clothes and dive into him. I know it’s the 1920s, and rationally, it cannot happen. But Garbo makes you suspend disbelief. Another thing: she could tell a story in gestures. People grant that talent to every silent actor, but most of them weren’t that great at it; they just had to be competent, because otherwise, they’d have no job. Garbo though? Watch her in The Kiss, reclining on her husband’s couch while he’s away, sitting behind the totally besotted Pierre (Lew Ayres, all of 20-years old), glancing at the back of his neck. Irene has, for the bulk of the film, treated Pierre as a silly but lovable child, and here too; but though Garbo’s mouth remains fixed in a smug grin, her eyes dance. He is handsome, and eager, and she’s a deprived wife. If she doesn’t act on her impulse, she can still enjoy the fantasy. Ayres, most famous for his role as Dr. Kildare, is better known to me as the actor who ruined All Quiet on the Western Front (1930). Here, at least, we’re spared his wooden delivery, and he’s believable enough as a wide-eyed, striking goof, a bit over his head with Irene and way, way over it once Irene’s husband shows up. Monsieur Guarry finds the two of them lip-locked (it’s less scandalous than it looks) and sets about to beat the boy to death. He just about does it too, before a door closes and shuts us out. Behind it, we’re told, Monsieur Guarry is shot. Who killed the old man? Irene is interrogated by cop after cop, her story held up to the light to expose its holes. This affords director Jacques Feyder (who has little else to do) the chance to toy with some pretty interesting sequences. For example, when Irene stumbles over a policeman’s questions re: the time of night, Feyder shows us the face of a clock: its arms moving forward and backward on their own to reflect her shifting memory. All this is in Irene’s mind, but it’s given directly to the viewer—the clock is a showed object, without visual context, which is something you rarely see in the Sound Era. From Rashomon-Lite, The Kiss now morphs to Pandora’s Box Extra-Lean, with Irene taking the stand in court, garbed in black; accused of murder and defended by the only man/lawyer whose faith in her is unbowed. Of course you know who that is. All this is rather heavy, or it could have been, had it lasted more than 20 minutes. If you’ve never seen a Garbo silent, by god don’t let this one be your first. The Kiss is not a bad film at all, but its charm lies in its oddness, and in the way it flings the Garbo mystique at you like an old sock. You have to know, going in, why that mystique matters; because The Kiss has neither the time, nor the inclination, to fill you in. My copy of The Kiss is a made-to-order DVD, purchased online from the Warner Archive Collection. I think you're being a bit too harsh on this film. Technically, the direction is remarkably fluid and at ease. Some scenes are filmed with such panache that Martin Scorsese would be envious. The production design is great too. Garbo is luminous and she has great chemistry with Ayres. The problem with the film has nothing to do with the film itself but with the time it was made: the film's running time is obviously short because production was cut due to the popularity of talkies. This was filmed as a silent and it was already obsolete so MGM didn't want to spend too much time and money on it so it's missing a third act. Blame talkies. But the first 30 or so minutes are glorious.